Getting your adrenaline fix might not seem like the obvious choice when planning a holiday to India. But, the range of adventure activities on offer here seems to be a well-kept secret! And, when thinking ‘adventure in India’, think beyond the Himalayas. While there’s a huge amount of fun stuff to be doing up in the north – check out this article for more on that! Don’t ignore the south. Its diversity of landscapes from the ocean to the hilly ghats, and everything in between, provide the best for adventure sports. In South India, you will of course find some great water-based sports, but there’s a bit more to explore too! So, here’s our pick of the best adventure activities in South India! Surfing isn’t a traditionally ‘Indian’ thing to do. But, with a coastline as vast as the country has, it’s not surprising that there are quite a few great surf spots to choose from. If you look eastwards, Puri’s beach has good surfing, as does Vizag. Surfing in Kerala happens primarily at Kovalam and Varkala, and there are also surf schools here in case you’re looking for a course. Further up the coast, Karnataka has a few great spots to catch some waves. One of the coolest things about surfing in India is that you won’t ever be sharing the waves with too many people! And if you’ve got your own equipment, there’s miles of unexplored and virtually untouched coastline to check out! If you’ve been to Goa, you’ll have seen the scores of basic water-sports facilities that you’ll find on most beaches there. Offering the usual suspects like jet-skiing, parasailing, banana-boat rides and the like. But Goa’s also got opportunities for some of the widest range of water-based adventure activities in South India. Way up in the north, you’ll find Vaayu Village, a fun, boutique guest house. It also offers surf, wakeboarding, stand up paddleboarding and kitesurfing equipment and lessons. It’s a relaxed place to hang out with other water-babies, and it’s also a great way to get introduced to these sports if you aren’t familiar with them! If you’re more of a land animal and like your adventure sports a little more mellow, the Western Ghats have some amazing treks that you can try. You’ll find everything. From challenging routes to easy half-day treks that are suitable for the entire family here. Maharashtra’s got some incredible hill-forts that you can trek to. Going right after the rainy season is amazing when the landscape’s full of vivid greens. And further down south in Kerala, there are rolling hills carpeted with tea and coffee plantations. They are so refreshing that they are also a birdwatcher’s delight! Because of lack of trekking infrastructure in terms of signposting and the like, we definitely recommend only venturing out with a reputable guide. We’re happy to help you plan your trekking holiday. Get in touch with us to answer your questions! Where there’s the ocean, there’s gotta be some diving! The Andaman and Nicobar islands are the obvious choice for any dive trips, but if you’re looking to get certified and don’t want to make the journey out to the islands, you can also consider Pondicherry. Admittedly, the visibility and diversity of marine life here isn’t as spectacular as it would be in the Andamans, but this actually it a great place to get your certification. Additionally, an artificial reef has been created off the north shores of Pondicherry, which has already increased the chances of spotting something exciting while you’re out in the water. Of all the adventure activities in South India, this is probably the one that excites us the most. 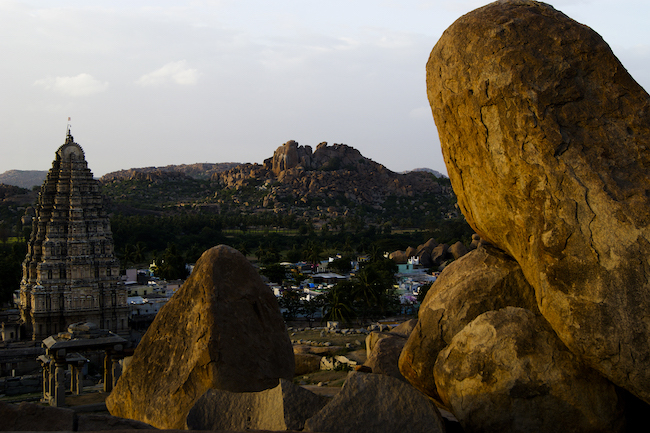 Rock climbing and bouldering are relatively new to the country, but, like with many other adventure sports, experts have discovered some awesome climbing routes in both Hampi and Badami, with something for everyone, no matter what your experience level is. Clubbed with the incredible history and culture that both towns have, this can be the perfect addition to your South Indian adventure holiday!